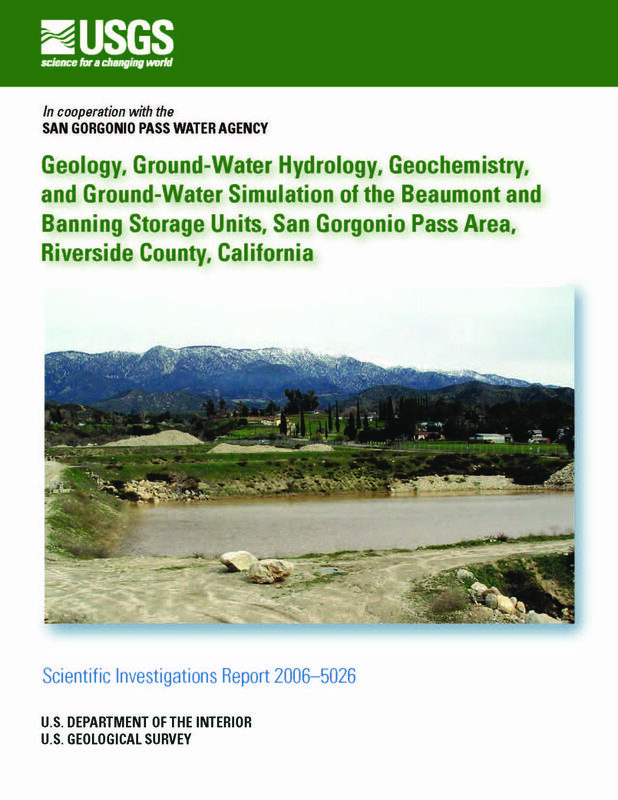 Ground-water has been the only source of potable water supply for residential, industrial, and agricultural users in the Beaumont and Banning storage units of the San Gorgonio Pass area, Riverside County, California. Ground-water levels in the Beaumont area have declined as much as 100 feet between the early 1920s and early 2000s, and numerous natural springs have stopped flowing. In 1961, the San Gorgonio Pass Water Agency (SGPWA) entered into a contract with the California State Department of Water Resources to receive 17,300 acre-feet per year of water to be delivered by the California State Water Project (SWP) to supplement natural recharge. Currently (2005), a pipeline is delivering SWP water into the area, and the SGPWA is artificially recharging the ground-water system using recharge ponds located along Little San Gorgonio Creek in Cherry Valley with the SWP water. In addition to artificial recharge, SGPWA is considering the direct delivery of SWP water for the irrigation of local golf courses and for agricultural supply in lieu of ground-water pumpage. To better understand the potential hydrologic effects of different water-management alternatives on ground-water levels and movement in the Beaumont and Banning storage units, existing geohydrologic and geochemical data were compiled, new data from a basin-wide ground-water level and water-quality monitoring network were collected, monitoring wells were installed near the Little San Gorgonio Creek recharge ponds, geohydrologic and geochemical analyses were completed, and a ground-water flow simulation model was developed. The San Gorgonio Pass area was divided into several storage units on the basis of mapped or inferred faults. This study addresses primarily the Beaumont and Banning storage units. The geologic units in the study area were generalized into crystalline basement rocks and sedimentary deposits. The younger sedimentary deposits and the surficial deposits are the main water-bearing deposits in the San Gorgonio Pass area. The water-bearing deposits were divided into three aquifers: (1) the perched aquifer, (2) the upper aquifer, and (3) the lower aquifer based on lithologic and downhole geophysical logs. Natural recharge in the San Gorgonio Pass area was estimated using INFILv3, a deterministic distributed- parameter precipitation-runoff model. 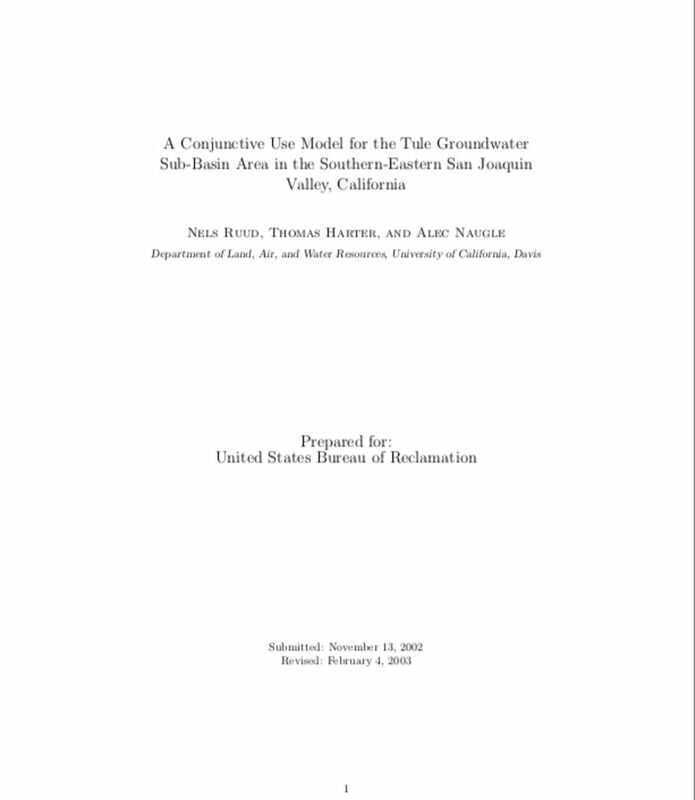 The INFILv3 model simulated that the potential recharge of precipitation and runoff in the Beaumont and Banning storage units was about 3,710 acre-feet per year and that the potential recharge in 28 sub-drainage basins upstream of the storage units was about 6,180 acre-feet per year. The water supply for the Beaumont and Banning storage units is supplied by pumping ground water from wells in the Canyon (Edgar and Banning Canyons), Banning Bench, Beaumont, and Banning storage units. Total annual pumpage from the Beaumont and Banning storage units ranged from about 1,630 acre-feet in 1936 to about 20,000 acre-feet in 2003. Ground-water levels declined by as much as 100 feet in the Beaumont storage unit from 1926–2003 in response to ground-water pumping of about 450,160 acre-feet during this period. Since ground-water development began in the San Gorgonio Pass area, there have been several sources of artificial recharge to the basin including return flow from applied water on crops, golf courses, and landscape; septic-tank seepage; and infiltration of storm runoff diversions and imported water into recharge ponds. Return flow from applied water and septic-tank seepage was estimated to reach a maximum of about 8,100 acre-feet per year in 2003. Owing to the great depth of water in much of study area (in excess of 150 feet), the return flow and septic-tank seepage takes years to decades to reach the water table. Stable-isotope data indicate that the source of ground-water recharge was precipitation from storms passing through the San Gorgonio Pass as opposed to runoff from the higher altitudes of the San Bernardino Mountains. In addition, these data indicate that little if any of the ground water in the fractured crystalline rocks flows across the Banning Fault into the Beaumont storage unit. Tritium concentrations indicate that little to no recharge has reached the water table since 1952 in most areas of the Beaumont and Banning storage units. In general, the uncorrected carbon-14 ages of ground water sampled from wells in the Beaumont, Banning, and surrounding storage units ranged from about 400 to 17,500 years before present. The older water was sampled in southeastern part of Beaumont storage unit and in the Banning storage unit, and ranged from 1,900 to 17,500 years before present. To better understand the dynamics of ground-water flow and the potential effects of water-level changes resulting from artificial recharge in the San Gorgonio Pass area, a regional-scale, numerical ground-water flow model was developed using MODFLOW-96. This model will be used by water managers to help manage the ground-water resources in the San Gorgonio Pass area. Results of the steady-state simulation indicate that the total inflow rate, or recharge, was about 6,590 acre-feet per year with about 3,710 acre-feet per year from areal recharge, about 2,670 acre-feet per year from mountain-front recharge, and about 210 acre-feet per year from the surrounding older sedimentary deposits. The simulated water budget for 1926–2003 indicates that of the total simulated volume of water pumped from the aquifer (450,160 acre-feet), about 50 percent was derived from depletion of ground-water storage (222,660 acre-feet), about 21 percent was derived from the reduction of underflow to the Cabazon and San Timoteo storage units (about 96,280 acre-feet), about 19 percent was derived from a reduction of ground-water outflow to the stream channels draining the San Timoteo storage unit (about 86,030 acre-feet), about 8 percent was derived from irrigation return flows and septic-tank seepage (about 36,780 acre-feet), and about 2 percent was derived from an increase in ground-water underflow from the surrounding older sedimentary deposits (about 8,410 acre-feet). The calibrated ground-water flow model was used to simulate the effects of four water-management scenarios being considered by SGPWA for the period 2004–13. 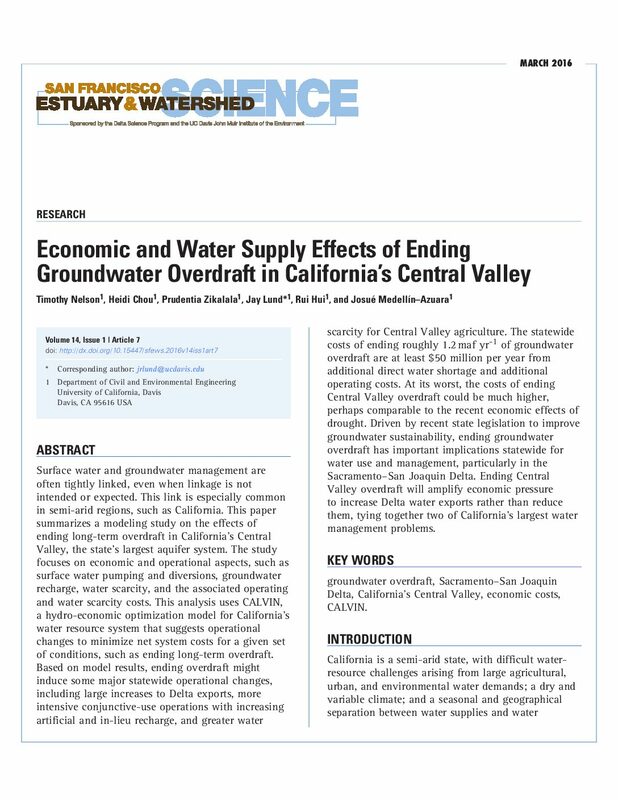 In general, the results of the water-management scenarios indicate that artificial recharge in the Little San Gorgonio Creek recharge ponds primarily benefits the area north of the Cherry Valley Fault. For the scenario that used SWP water in lieu of ground water for golf course irrigation and for agricultural use, hydraulic heads increased by about 50 feet. None of the water-management scenarios significantly benefited the Banning storage unit. In 1920, the Tehama County Superior Court of the State of California adjudicated entitlements to all Mill Creek flow below 203 cubic feet per second (cfs). As such, water right holders on Mill Creek legally divert a significant portion of the surface water flow for agricultural beneficial use. During certain times of the year, especially during dry or critically dry years, the agricultural demand for surface water can reduce Mill Creek flow and expose in-stream barriers to fish migration. Fishery experts recognize Mill Creek as a high priority stream for the protection and enhancement of Chinook salmon spawning habitat. Mill Creek surface water diverters currently participate in a long-term cooperative management plan to help provide sufficient flow for fish migration while also maintaining irrigation supplies and the recognition of surface water rights. As part of these efforts, Mill Creek water users participate in water lease and groundwater exchange programs designed to increase in-stream flow during critical spring and fall fish migration periods. 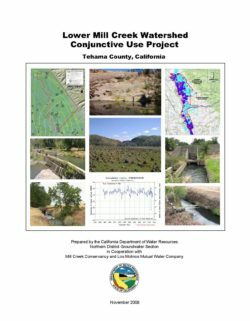 Along with other entities, the Department of Water Resources (DWR) plans to establish methods of monitoring and studying fish passage, assessing agricultural water use efficiency, and examining the potential for additional use of groundwater as opposed to use of surface water diversions in the Lower Mill Creek watershed. 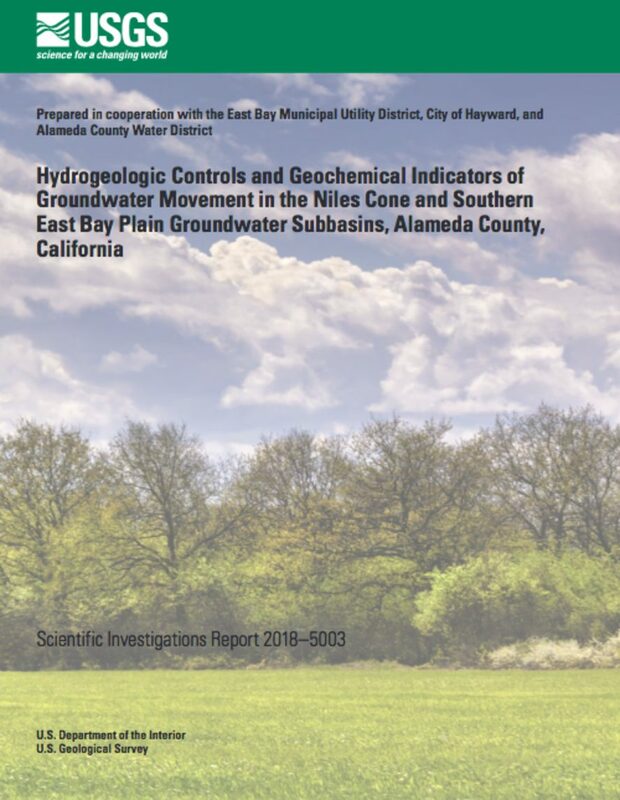 This report provides a background of the geology and hydrogeology in the Lower Mill Creek watershed area, a detailed discussion of the groundwater resources, and an overview of the potential for conjunctive use of surface water and groundwater resources. It also provides recommendations for additional groundwater monitoring and potentially favorable locations for production well installation associated with possible future conjunctive use programs. In 1992, California State Legislature adopted the Groundwater Management Act (California Water Code Part 2.7, §10753), originally enacted as Assembly Bill (AB) 3030 and amended by Senate Bill (SB) 1938 in 2002. The Groundwater Management Act provided the authority to prepare groundwater management plans and encouraged local agencies to work cooperatively to manage groundwater resources within their jurisdictions and groundwater basins. 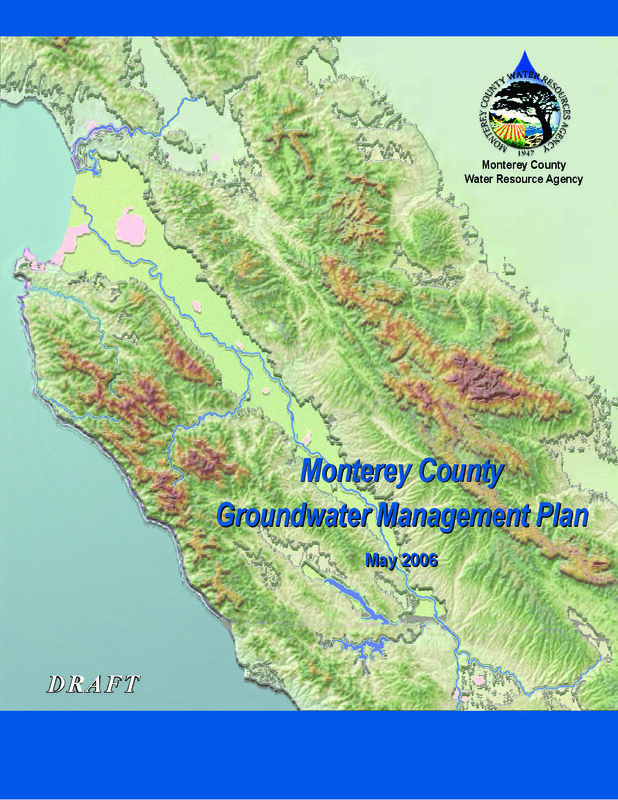 Monterey County Water Resources Agency (MCWRA), recognizing that management of its natural water resources is critical to ensuring a long-term sustainable and reliable good quality water supply, has prepared this Groundwater Management Plan (GWMP). 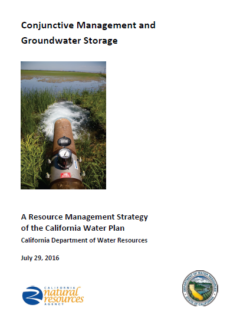 The purpose of the GWMP is to provide a comprehensive overview of the Salinas Valley Groundwater Basin and to recommend various management strategies for the basin. 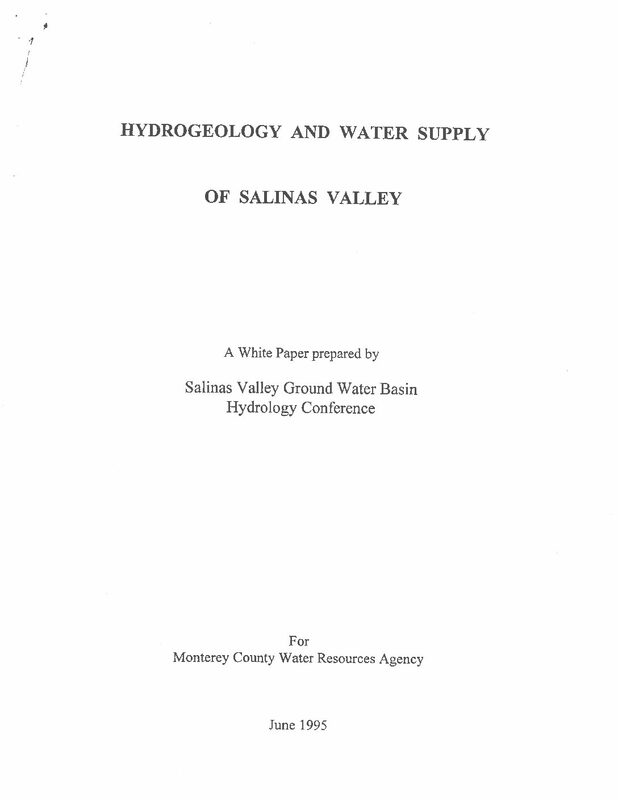 Specifically, this document provides the framework for the management of groundwater resources in the Salinas Valley Groundwater Basin (exclusive of the Seaside and Paso Robles subareas) and acts as a guidance document for future groundwater projects. While this edition of the GWMP focuses on the Salinas Valley Groundwater Basin, MCWRA is responsible for the management of the water resources for all of Monterey County. 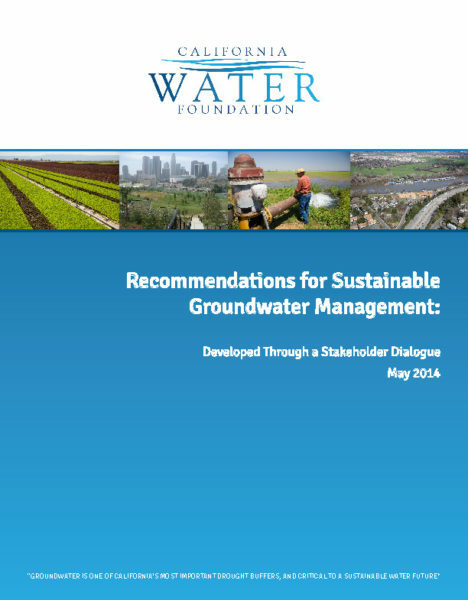 Future GWMP versions will incorporate the additional groundwater basins in the County. 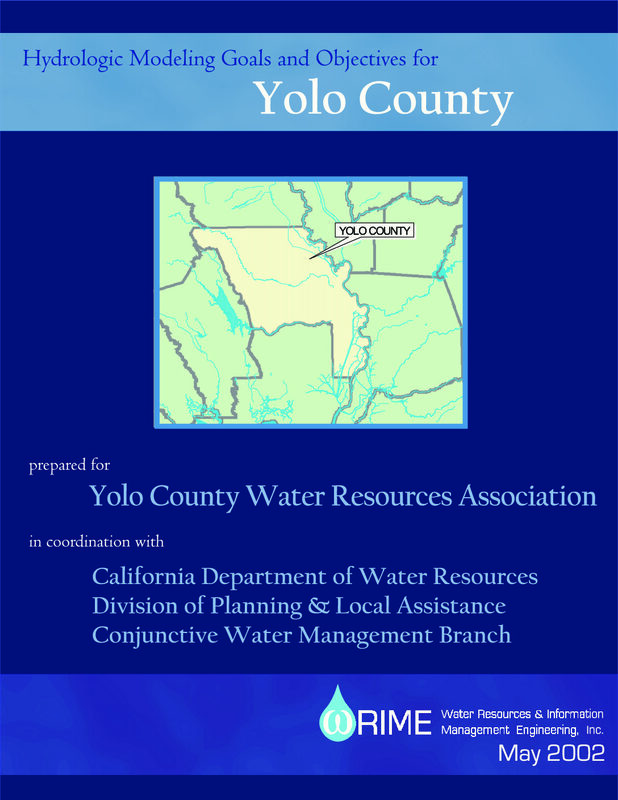 This document has been prepared in accordance with existing regulations as outlined in the California Water Code (as referenced above) and was prepared in coordination with local agencies and interested residents through public outreach activities.